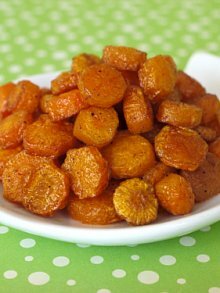 These roast carrot coins are amazing! I used organic carrots and they actually taste like sweet potato fries. Careful to check them at the half way point to make sure they don't burn. 2. Place all of the ingredients on a baking sheet and toss to combine.